We make plans and lists for all kinds of great reasons: It’s the beginning of a new year and time for resolutions; a desire to become healthier; we want to improve our relationship with our spouse; a possible promotion at work or job in another city; we feel the desire to grow closer in our relationship with Christ. Some of us are born list makers and planners. This just comes naturally to us. Are we running low on milk at home? What bills need to be paid this month? Does someone need a marathon training program? Is there a vacation coming up? Before many of us can even finish these questions, there are others that already have each step planned out. For the rest of us, we often fight lists and plans from our very core and there may be an occasional rolling of the eyes at those “planners”. However, at some point, we all make plans. We are encouraged by an authority figure, a pastor, a boss, someone we look up to, a friend or even a family member. They see the real potential in us; they sincerely tell us that they want more for us; they light the fire in us that challenges us to make a pledge or a diligent plan. Do you write your plans in ink or in pencil? When a plan’s been made, how open are you to those plans being changed? If I ask most believers (yes, non-believers, we’ll let you off on this one) if they are open to God changing their plans, the answer is almost always “Yes!”. But, what do their actions say? If I look at my own life since following Christ, there are often times when I will cling to a plan or challenge, once it’s made. After all, there were good reasons we made that plan, right. Maybe, just maybe, we’ve missed the point of making plans. Maybe, it’s the act of thinking about who we’re becoming, who He wants us to become, the effects of our choices today and the diligent thought that goes into planning that God wants us to focus on. Dwight Eisenhower, 34th President of the United States, former five-star general in the U.S. Army and the Supreme Commander of Allied forces during D-Day once said, “In preparing for battle I have always found that plans are useless, but planning is indispensable.” This man led thousands of people through incredibly pivotal and complicated times and laid the foundation for systems that we still use today – kind of responsible for the whole Interstate Highway System, and he thinks “plans are useless”. Maybe, he has a point. I’ve learned over and over that when God interrupts our plans, He has something in mind that I don’t, and His plans are always better than mine. It’s not always easy to see where the next step is to take, but faith is like a muscle – it grows as we use it. It’s at these times when God may be trying to change our plans that it’s critical that we seek Him and trust Him. Remember, a relationship is about spending time with a friend – open the New Testament and spend some time in prayer (listening, not just talking…). It’s easy to trust Him when He lets us continue with our plans. They seemed “right” when we made them. We might even ask if there is any trust involved in those situations. It’s when He wants to change our path or a commitment that we’ve made that it gets difficult. So, plan; accept challenges; think about the future, the goal you have and that God has for you. Then, write your plans in pencil. Let God lead us through the daily details. As He reveals His desires for us, give yourself the flexibility to erase the next line in your plan and pencil a new next line, based on the new direction He has shown you. If we keep our eyes focused on Him, He will see us through to a conclusion more glorious than we could imagine for ourselves. God has big plans for us as individuals and as a community, but he doesn’t necessarily give us the details beforehand. It’s not simply the destination that is important; it’s the journey to that destination that the Lord uses to grow us in our faith and knowledge. I’m excited to see where God leads us!!! Are you in? Prayer for this week: Lord, thank you for all of the plan B’s that you continue to bless me with. I make my plans today with my eyes and heart focused on you. I know that you are infinitely greater than I am. Help me to be open to the paths that you put before me and shine a light at my feet in the direction you want me to proceed. Do you have a major choice coming up? 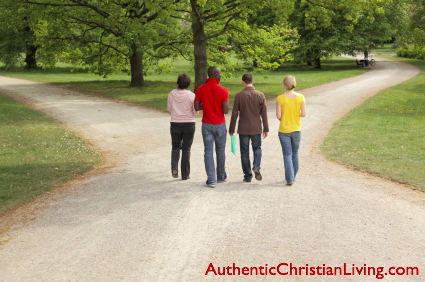 Are you open to God taking you in a different direction than you planned? When should we stick to a decision or choice that we’ve made? Do you think it’s possible that our desire to stick to plans that we’ve created may hinder or even impact God’s desired plan for our lives, the blessings He wishes to give us and the opportunities He would like to use us for? 7 Comments on Are you open to God changing your plans? I am willing to go anywhere, or do anything that God calls me to do. But the plans he has made for me are too exact, and after all, I did not make these plans he did, and he has made it very clear, what he want's me to do. But he probably has some plan's along the way, that I am not yet aware of. Like yesterday when I visited the Living Water Church in Brandon, I feel God want's me to start going to this Church all the time and Maybe this will be the first Church that I give my testimony to. I do pray that let God’s plan prevail in my life, they He again uses people or situations that will open doors or signs of His direct and perfect will in my career and lovelife..Thy Will Be Done! Its amazing how GOD works! David Jones Hollie Trivette. amazing blog post. 2013 is going to be a year of Faith for Chicks With Choices. We feel Gods direction but in the next 3 months we will see what path he has for us as we try to start this new outreach. some wonderful questions and self reflection from reading your post. Thank you for sharing.